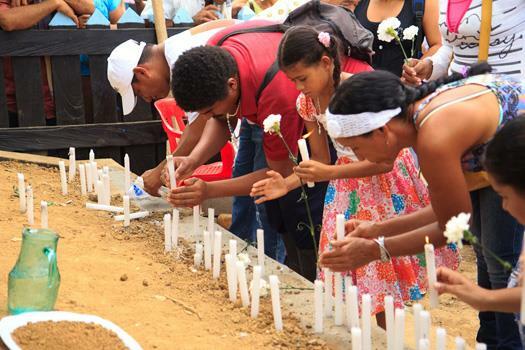 More than 500 social leaders and Human Rights Defenders have been killed in Colombia since 2016. These killings are systematic in nature. Victims are targeted because of their political, social or community activity, especially those which challenge the interests of economically-powerful groups. Join us to find out what you can do to #DefendtheDefenders. The hope that the peace agreement between the Santos Administration and the FARC would bring security for all is rapidly fading. Instead, an increasingly authoritarian government responding to the interests of corporate power, coupled with a burgeoning of paramilitary activity and indiscriminate violence, bears all the hallmarks of the type of predatory extractivism that led to the armed conflict in the first place. Civil society and the international community must take action to #DefendTheDefenders in Colombia. Joining the commemorative acts on the Colombian National Day for Memory and Solidarity with the Victims of the Armed Conflict, this event brings human rights defenders, academics, practitioners and politicians to discuss the current situation in the country, and what we can do to support those on the frontlines. The organisers will launch the #DefendTheDefenders campaign on the night of the event. #DefendTheDefenders is a campaign formed of civil society and human rights organisations based in the UK to oppose and raise awareness of the murders of human rights defenders in Colombia. This event is organised by War on Want, Justice for Colombia, Rodeemos el Dialogo, UCL Colombian Society, Colombia Humana (Nodo UK), Congreso de los Pueblos (GB), Colectivo Aji, amongst others.